This is not the first time we review a Monrio component. 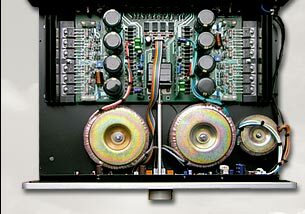 Indeed, we reviewed their entry-level integrated amp, the Asty, back in 2001. This MC 207 under test is Asty's bigger brother, the latest evolution of the former MC 20x series. First came the 202, then the 200 and 205 and finally this 207. The Monrio MC 207 is a solid-state fully dual-mono integrated amplifier, spec'd for 80 watt per channel on 8 Ohm, 135 watt on 4 Ohm. The dual-mono concept has been applied down to its extreme consequences as it starts right from the power supply section. Indeed, this makes use of two 200 VA toroidal transformers and 4 x 2 sets of caps for a total of 80,000 uF while a third (!!! ), smaller, toroidal transformer is used for "services". The MC207 has 5 line inputs (no phono, TAPE IN included) + a TAPE OUT output. Also available is a DIRECT input, which is a standard "main in" i.e. a direct access to the power stage. This way the MC 207 can be used as a pure and simple power amp, for example in multichannel applications or with a better preamp for a step-by-step upgrade. Input selection is assisted by servo-controlled relays, activated by the input selection keyboard in the front panel. Small, red leds indicate which input has been selected. After power on the amplifier enters a stand-by mode. One curious aspect is the volume knob, which reports Roman numbering: e.g. 12 o'clock position reads as XII. The front panel is a classic aluminium fascia while the rest of the cabinet is plain black. Aesthetically, the MC 207 appears unobtrusive and living-room friendly. The rear panel hosts gold plated RCA inputs and gold plated loudspeaker binding posts. An IEC-standard mains inlet is also supplied. The Monrio MC 207 has been tested for 3 months with different loudspeakers, cables and sources. This amplifier has been designed with a precise goal in mind: to make an amp with excellent driving capabilities at an affordable price. If this brings you memories of small, entry-level integrated amps on steroids, so popular during the Eighties, well, think again. Nothing, of the sound of this amp, can be related to those amps. One may expect a rough and rude musical presentation with overblown bass but the MC 207 is nowhere near to that. Quite the contrary, it sounds lively without being aggressive or harsh. It possesses a slight tendency to sound "open", still with deep and controlled bass. Sparkly is - perhaps - the best adjective that can characterize the sound of this unit. It doesn't impress the listener, though. It does nothing to draw one's attention towards its performance as it prefers to conquer the listener with grace, in the long run. The openness of the mid-high range graces voices with a touch of "presence" that is welcomed most of the times. Actually, on certain overbright recordings, sibilants may appear as slightly remarked, especially with female voices. It is NOT something added (read: distortion) by the amplifier, it is rather a way to underline some aspect of the recording. For example, in "Rosemary Plexiglas" (Scisma - 1997 EMI Music - 7243 8 21097 2 3), Sara Mazo's voice is affected by sibilants and the MC 207 does nothing to hide them (quite the contrary, indeed). Anyway, sibilants DO exist in nature, it is a typical audiophile paranoia the will to hide or tame them. It is true that sometimes sibilants are associated with distortion but this is NOT the case. Moreover, dark and shut-in recordings or HiFi systems can benefit from the "spark" offered by this amplifier. For this reason, on certain recordings and HiFi chains, this peculiar tonal balance can easily end up as "too much of a good thing". What about the mid-bass and the bass range, then? Considering the attitude to sound open and sometimes bright, this amp could have been "thin" if it came without a decent bass "support". Luckly, you still get all the bass you need and then some. In the bass range, the MC 207 is a savvy mix of control and power, depth and smoothness. The bass lines are articulated and coherent, even when the amp is under pressure. Only the first octave seems to lack some articulation. With highly demanding (bass-wise) musical programs (Morcheeba, Massive Attack, Rage against the machine...) the Monrio MC 207 retains control and drive, even with the toughest loads. For this reason, the overall performance of the amplifier is quite satisfying. The tonal balance, while exhibiting a slight "tilt" in the highs, is still natural and enjoyable. Most of the times, one tends to forget it so to concentrate on Music alone. For what should be a "wire with gain" this is one of the best things one can say. That said, you may ask: what if this amp has to reproduce clearly "wrong" records, with overbright mid-high range and compressed dynamics? Would it become a savage beast, a torture for my ears? Just the time to grab "Be here Now" (Oasis - 1997 Sony Music - 488187-2) and there I am, listening to one of the worst recordings of my collection...No, the album is - musically - pure gold but the quality of the recording is near zero. Or sub zero. To make things even harder, I decide to plug a pair of Merlin TSM-MM monitors to the Monrio. These speakers - soon a listening test here on TNT-Audio - are utterly transparent: they can reveal any small detail that reaches their binding posts. No forgiving gear, I admit. This means the amp can sound open without being harsh or rough...and that it can reproduce almost anything with class. The beefy PSU matched with the dual-mono architecture make this amp a fearless current generator. I've tried anything I could to make it suffer but to no avail. It drives any load with ease, always sounding pacey and dynamic. Only if compared with better (--> more expensive) amplifiers one may wish more speed, especially on attacks and decays. For example, a Naim NAP 250 power amp is faster and pacier, but have in mind the price tag and the fact Naim amps excell in terms of speed and timing. Actually, the MC 207 reveals once again its character: mature, controlled and discreet. Violent, impulsive current requests, such as drums in Rage against the machine's first album or low-frequency synth attacks on Massive Attack's "Blue lines", are handled with ease by the Monrio. Even with highly demanding orchestral works the MC 207 performs quite well, for example when dancing among Respighi's "Pini di Roma" or swimming into the "Fontane di Roma" (Telarc ed.). Brasses and triangles shine with their typical metallic nature, even under high power drains. This amplifier is capable to handle large orchestras as well as small ensambles. It does nothing to impress, but it gets the job done, quite easily. It performs very well in the microdynamics department, as well, thanks to the introspective character of its mid and high range. This Monrio MC 207 exhibits a realistic soundstage, with proper and geometrically correct 3D information. Width, height and depth blend very well together. Thanks to the peculiar tonal balance, the whole stage is graced with a bright light: singers and players appear clearly focused and stable in it. I was ready for a rather "forward" stage presentation but the performance of the MC 207 surprised me a litle bit. There's depth, air and "life" surrounding the elements of the 3D scene. Well, it is NOT the "big" sound you can get from "big" amplifiers but one shouldn't forget we're talking of a 1500 Euro integrated amplifier, entirely hand-built in Italy (and not in China ;-)). After all, there still exist hierarchies in HiFi: normally, bigger and more expensive amplifiers sound better than less expensive ones. Yes, there are exceptions...but the Monrio isn't one of these. As for "warm-up" I'd say 30 minutes are sufficient to get the best out of this amp. Even right from the start, the MC 207 doesn't sound bad: after all, it remains in stand-by mode! As for loudspeakers matching, feel free to connect ANY load, the MC 207 won't be in trouble even with impedances as low as 2 ohm (minimum). The only speakers I'd avoid are bright-sounding ones as the match can become ear-fatiguing in the long run. I'd strongly recommend dark and shut-in loudspeakers: the Monrio MC 207 could add a spark of life to their sound. Manufacturing and finish. This unit is nicely built and adequately finished, given the price tag. The top cover is a bit resonant, perhaps some damping treatment should be planned. The quality of the RCA inputs is low as the very same females can be found on extremely entry-level gear. Furthermore, they are placed between the speakers binding posts (see pic), because of the dual-mono architecture. In some cases this uncommon reciprocal position may lead to annoying intersections and overlaps between interconnects and speakers cables (not good). From a purely functional point of view the unit works well, the input switches are solid and reliable. Aestethically, the MC 207 appears as it sounds: discreet, mature and unobtrusive. Personally, I dislike the alu-silver fascia matched to a black cabinet. Stock feet are the ubiquitous hard rubber half-spheres. Sound. Living with the MC 207 is an easy task. In my personal "wish list" I read: a better articulated first octave, a softer higher end and a warmer balance. Don't get me wrong: your mileage may vary, these are just my personal preferences. The sound of this unit is never thin or esile. Quite the contrary, this amp sounds always solid and consistent. The Monrio MC 207 is an integrated amplifier designed and built having a serious and mature audiophile in mind. No audiophilia-nervosa sufferers, no upgraditis-addicts, thanks. It gets the job done with a purely no-frills approach. It drives anything, it plays anything and it does all that rigorously, without excesses. In my opinion, it could be the ideal amp from anyone who doesn't want to spend an arm and a leg for listening to his favourite Music and for anyone wishing to buy something meant to "last". No tweaks, no upgrades, no frills...just Music.